But I have to admit, sheepishly, that I’ve always been confused by one thing — the difference between horsepower and torque. I get that they’re both ways of looking at how powerful a car is, but I’ve never been quite sure what each is actually measuring in physical terms. Let’s start with torque. From an automotive point of view, torque tells you how much power an engine produces to get a car moving. For engineers and physicists, though, torque means the amount of force put on an object to make that object rotate. Or put another way, it’s the amount of twisting force applied to something. For instance, imagine for a moment that you’re in your kitchen and you want to make a peanut butter and jelly sandwich. You’re trying to get the jelly jar open, but it’s stuck. You’re grabbing on the lid as tightly as you can and twisting with all your might — you’re applying torque. According to NASA, the maximum amount of torque a person can exert on an object in a clockwise motion using their hand is, on average, 121.5 pound-inches (lb-in), or 10.125 pound-feet (lb-ft). where F is the amount of force (in pounds here in the US and newtons everywhere else) and r is the distance between the rotational axis of the thing being rotated and the point at which the force is being applied (in feet or inches here, meters or centimeters elsewhere). 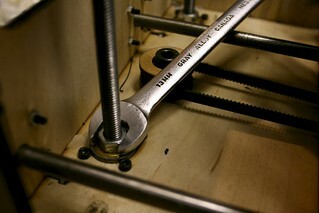 Put another way, r is the length of the lever you’re using to twist whatever it is you want to twist. T = (1.5 in + 6 in of lever) x 81 lb = 7.5 in x 81 lb = 607.5 lb-ft.
By extending r, you’ve greatly upped the amount of torque you can apply to the jar lid. Now nothing will stand between you and your sandwich! True. But the crankshaft inside your car’s engine does. As each piston fires, it exerts a twisting force on the crankshaft through the connecting rod, forcing the crankshaft to rotate. That amount of twisting force is what gets recorded on your car’s spec sheet. The more torque = the more twisting force the engine puts on the crankshaft = the more power the engine has available to get the rest of the car moving. Torque took a bit of explaining, but horsepower is a bit simpler: It’s pure straight-line power. Or put another way: Torque gets you moving, horsepower keeps you moving. Horsepower is a unit of measure for power, telling you how much work an engine, horse, or person can perform, and how quickly. Now, that’s work in the physics sense, meaning the amount of force needed to move an object, like a car or a cart or a bag of groceries, over a certain distance. Yes, but the difference is in the feet. Remember, in torque we were talking about the amount of force applied to a lever to get something to turn, where the feet refer to the length of that lever. Here, we’re talking about the amount of force needed to move something in a straight line, where the feet refer to the distance moved. The guys at Jalopnik have a handy infographic (look to the right) that explains where horsepower comes from and how it works. And if you read it, you’ll notice a funny thing about horsepower: If you keep the amount of horsepower and the amount of time constant — say, 1 minute — you can either move a really light thing really far or a really heavy thing a short distance and still exert the same amount of work. Or you can keep the time and force constant, and see what happens when you play with horsepower and distance. So, as Jalopnik says at the bottom of the infographic, a 50 hp Volkswagen Beetle could plausibly pull a big-rig cab 100 feet in 1 minute. But by my math, the above-mentioned Bugatti Veyron, which produces 1,001 hp — or 330,033,000 foot-pounds/min — could pull that same truck cab 2002 feet in the same amount of time. All of which assumes that the Beetle’s engine could produce enough torque to get moving which hitched to the cab in the first place.